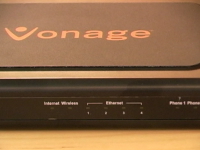 Vonage and D-Link announced the availability of the VWR, a Wireless-B/G Broadband Router with 2 phone ports bundled with Vonage's service. The product leverages the Texas Instruments' TNETV1060 VoIP gateway chipset for QoS and good voice quality. The D-Link VWR packs four devices in oneone - a Wireless-B/G Access Point, a built-in 4-port switch to connect wired Ethernet devices, a router function so the entire network can securely share a single cable or DSL Internet connection, and two standard telephone jacks. Great for those of you out there who don't already own a home wireless/wired router or firewall. But why don't you already have a home wireless network? What's wrong with you people? This VWR runs $59.99, after a $40 instant rebate. This VWR runs \$59.99, after a \$40 instant rebate.